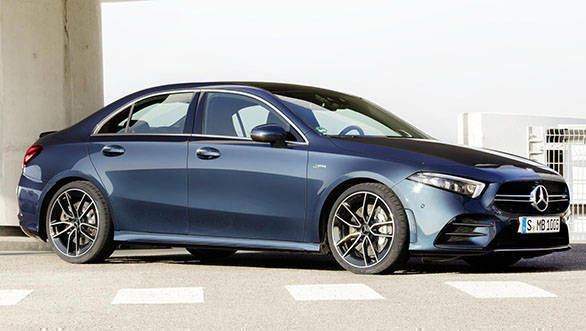 2019 Mercedes-AMG A 35 sedan is the latest offering from the performance division of Mercedes-Benz. The compact performance sedan is based on the A-Class sedan that was launched last year, and looks to target young buyers looking for a sporty performance along with comfort and space for passengers and luggage. The A 35 sedan is powered by a 2.0-litre turbocharged four-cylinder engine making 306PS of power and 400Nm of peak torque. Mated to Mercedes's seven-speed dual-clutch transmission, the car propels from 0-100 kmph in 4.8s and has an electronically limited top speed of 250kmph. It comes with Mercedes's 4-MATIC all-wheel drive with variable torque distribution. This results in the power being distributed to the front wheels, only 50:50 distribution to front and rear depending on the driving. Also making its way into the car is AMG's dynamic select drive programmes, which offer slippery, comfort, sport, sport+ and individual driving modes. 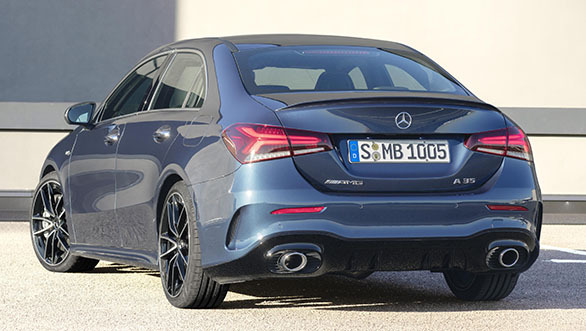 The exterior of the car resembles the A-Class sedan with AMG treatment all across. This includes the trademark AMG grille, a new rear-diffuser, a lip spoiler and 18-inch AMG allow wheels. The interiors follow the AMG theme, offering AMG sports seats at the front and flat-bottomed steering from the larger AMG cars. It come with the latest MBUX multimedia system first seen in the new-gen A-Class, with gesture controls and the "Hey Mercedes" voice command system. While the A-Class sedan has not yet been launched in India, the AMG A 35 could be a tempting option for enthusiasts looking for dynamic performance in the entry-level luxury sedan segment.